Some people never change whereas others have an inner drive to constantly change, reinvent and explore new avenues. Anders Trentemøller definitely falls into the latter category. 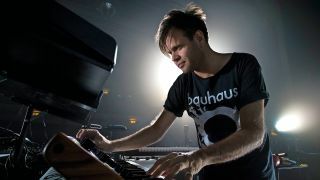 Having cut his musical teeth in the world of indie rock, Trentemøller had something of an electronic epiphany that resulted (thankfully) in his influential 2006 debut album, The Last Resort, which saw his star rise. His follow up albums, Into The Great Wide Yonder and 2013’s Lost, have since seen Anders cement his reputation for his distinctive production sound, inventive remixes, immersive live shows and, perhaps most importantly, as a damn fine songwriter. Fixion, his fourth artist album, sees Trentemøller refine those songwriting skills yet further on songs such as the sublime River of Me, and the icy electronic pulse of Redefine showcases his continued growth and prowess in the studio. We hooked up with Anders Trentemøller at his recent London live date to find out more about the desirable collection of synths, software and outboard that he uses to such good effect on the beautiful, Fixion. In these times of limitless studio possibilities, it’s refreshing to meet a producer who knows that, often, less can still be more. Would we be right in suggesting that the new album sees you go even further into the cinematic vibe of your recent outings? Fixion certainly has some beautifully written, subterranean songs on it. 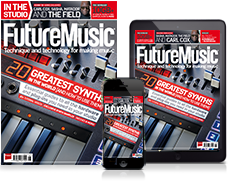 Have guitars usurped the synths in your songwriting process? We last spoke prior to the release of Into the Great Wide Yonder. Are you still in the same white studio you were for that album? What’s the backbone of this studio set-up? Are you still using a lot of tape machines? Most of the time when I use plugins I usually re-amp them through a guitar amp or put them down to tape as they tend to sound a little bit too polished... too perfect, so to speak. Having Henrik ‘en suite’ must be like having a MIDI drummer on tap? What were your drum machines on Fixion? So, putting that little extra time and effort into processing plugin sounds can really pay dividends in the mix? Getting to know the contents of your sound library well is becoming an important part of the music making process nowadays isn’t it? So, you’ve mastered the fine art of nailing down which sounds to use and sticking with them? We would assert that what sets your music apart sometimes is that strength of the songs and the songwriting... Do you think people sometimes use the technology but forget the song? Once you’ve done all that work on the actual songs, do you keep everything in the box for the mixing process? If I’m working on a song, I don’t really want to spend too much time initially finding the right sound as I’d rather use that time to capture that vibe that was there when I got the idea; to have that spontaneous energy is good and if I have to go through a lot of different synths and sounds then it kills it for me. What is it about Ableton that’s kept you faithful to it? "It’s maybe because I’ve been working with it for such a long time now that it’s very easy for me to do edits. It’s still a bit of a nightmare if you’re doing multiple channel recordings because it’s not really built for that so I do sometimes miss some of the features of, say, Pro Tools or Logic. Again, if you’re recording vocals and you want to do a second or third take on the same song then you have to set up a new track with all the plugins as it’s really not made for doing that either. Do you use Live Racks much? Seems like an appropriate, if somewhat obvious, time to ask you what other plugins and softsynths you used on Fixion? Are there any others from your hardware synth collection that you used a lot on the album? We assume that you’re running Ableton Live for syncing everything up at the live shows? Do any of the rest of the band use any synths live? With everyone going modular crazy, is that something you’ve ever looked at incorporating into the studio or live set-ups? When you go out live do you take the PolySix and the old Loganstring synth out with you? "No. I was actually thinking of taking the string synths at one point but they’re so heavy and not always so stable. I thought a lot about what I could use live that sounded like those and I found Waldorf’s Streichfett, which is their little MIDI module dedicated to those old string synths. It actually sounds pretty nice and captures that sound really well so it’s in the live rig on tour. I also recently bought the Mini Mellotron that’s actually the digital version of the old Mellotron so you can mix two sound banks together and it really sounds good. The vocals on Fixion are really nicely recorded. Is that a result of some expensive boutique mics and compressors? That nice mix of the hardware/software worlds? What I like most about playing live is that it’s the perfect contrast to me sitting alone for a year in the studio making an album, which can be quite a lonely process. With all these lovely guitar pedals, we’re guessing you love to trawl the music shops? What do you like most and least about being a producer or a musician? Fixion is available on In My Room. Visit the Trentemøller website for regular updates and tour dates.